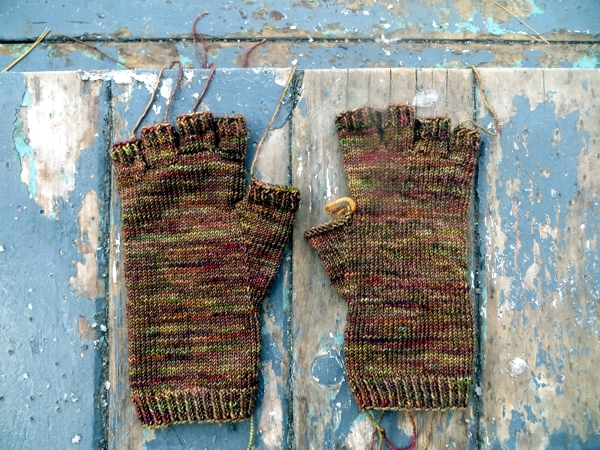 Some knitting just flies off your needles, and some makes a tortuous journey into the depths of despair before getting anywhere near turning into something you were glad you did. 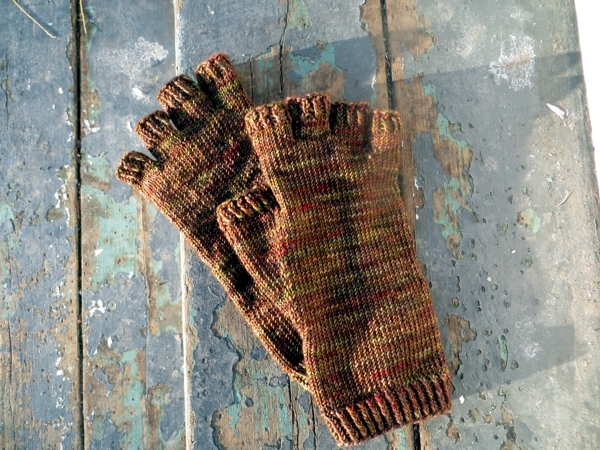 These fingerless gloves, for example. I cast them on last year at about this time, expecting them to be finished in spring and well-used come fall. 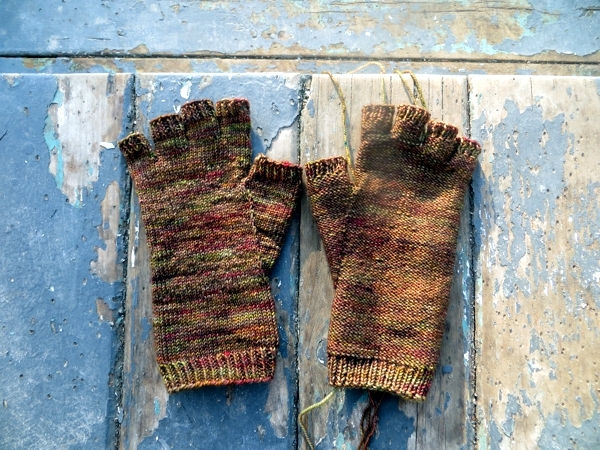 But they proved to be so complicated once I got them up to the fingers that I had to put them away and concentrate on Christmas knits. Then, when I was getting all my yarn and gear organized in the new year, I dug them out again thinking they could now be a priority. Ha. They were still fiddly and complicated, and to make matters worse I wasn't convinced I liked them - which is the real reason, I'm sure, they were back-burnered. 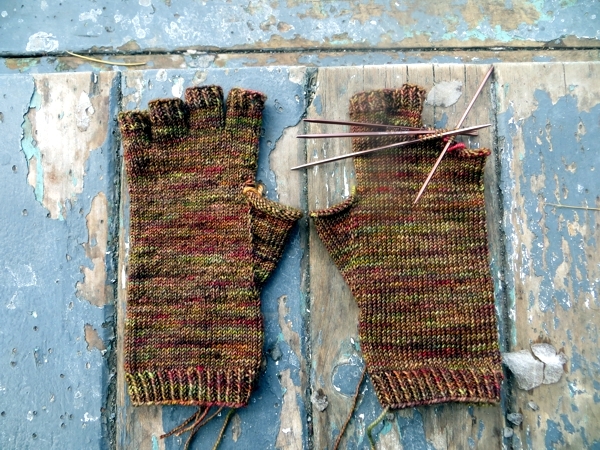 But it seemed a waste not to leave the fingers in once I'd started, if only so that I'd have an easy reminder why I shouldn't try to knit fingers another time. I tried to persevere. At long last, after putting sleep first like a sensible person, I was finished - Yay! - and then I realized that running in all those tails was going to be another Herculean effort. Not that I minded doing them, but in spite of not being unbearably fiddly they take time and attention, and I kept on being short of either. Ultimately it was putting them at the top of my current week's To Do list over and over again that got them through to wearability. That, and investing in some really good audiobooks. 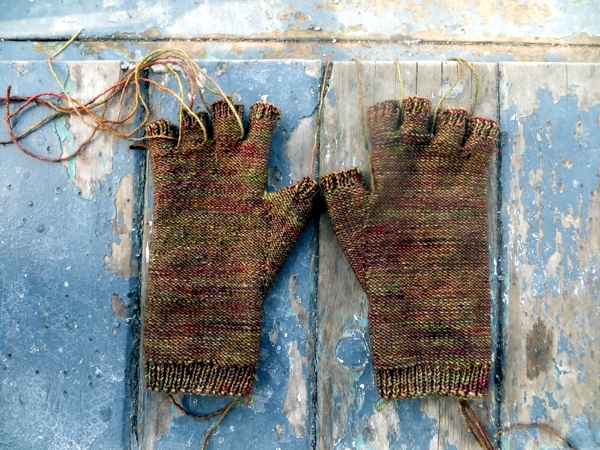 And now that they're finished - not actually blocked, but the knitting done - I am so happy. I even like that they have finger pockets - though they they probably will be the only fingerless gloves I ever make that do, because Yikes. 12 months, guys. That is a long time for something that isn't a sweater. Have a wonderful weekend and I'll see you back here again on Monday! Love the gloves! What good audiobooks have you listened to lately? I really (really, really!) enjoyed The Rosie Project and a romance by Susan Elizabeth Phillips, but everything by her is usually wonderful! Leslie, I'm listening to a fantastic book about Nancy Wake, who worked in the French Resistance in WWII. I'll have to do an updating Knitting Aids post soon because I've been enjoying some great audiobooks and movies lately!